When Omaha’s transportation system changed from Metro Area Transit (MAT as we all knew it) to Metro, it was said that they were a changed company looking forward to a bright future and “a new direction.” In the nearly three years since then, we’ve seen many positive changes such as new buses, redesigned maps and schedules, and a renewed commitment to the community as evidenced by such programs as Stuff the Bus and Books by the Busload. Original style transfer sign installed in 2011. 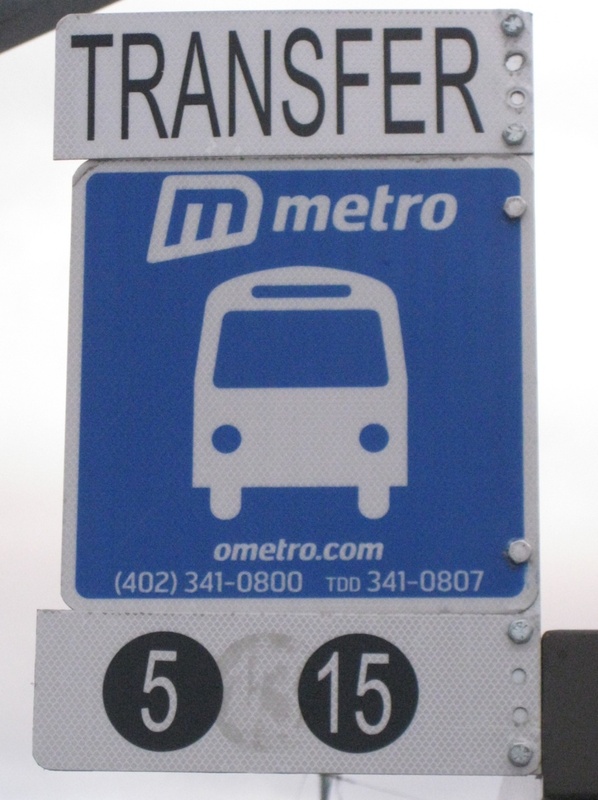 Perhaps the change most unnoticed by the non-bus riding crowd—lost amid the publicity of the new buses and speculation of whether Metro was really headed in a new direction—is the addition of transfer stops. These stops were a new way for transferring riders to easily identify where to get on their next bus. Distinguished from regular bu stops by a white section that reads “Transfer” and the routes that serve them, these signs are a humble, yet important piece of the bus transportation puzzle. In the past, the MAT stops were one of four styles of white squares that dated as far back as the 1970s, or blue stops much like the ones we see today. None of the old signs gave any indication of a good place to transfer, and although MAT’s bus maps showed transfer points, there wasn’t a way to find them while out on the streets. For the past two years, the transfer stops have solved this problem. Although they were a step in the right direction, there was a notable lack of uniformity in the transfer stops; some of them looked as if the edges were shaped by simply free-handing with tin snips and calling it good. The stops were seemingly over-simplified, as if the designers thought any more words would confuse riders. These are a couple of what some might consider trivial problems, but as a bus rider I was left feeling unimportant and played for dumb…Okay, maybe that’s a little dramatic, but in all reality, something was missing. New transfer sign installed in 2012. As far back as a year ago, a couple of new transfer stops could be seen at 84th & West Center, and 90th & West Dodge. Since I am always looking for the newest improvements at Metro, I immediately noticed a big difference compared to the old transfer stops. These new stops appeared to be uniformly made of stamped metal, replacing the old cut look. They are made of two pieces rather than three, eliminating the thought that they might be made of small pieces of scrap metal. They say “Transfer To Route(s)” making for a slightly more intelligible sign. And now the white strips that bookend the old transfer stops are consolidated into one continuous white transfer field. And to top it all off, the sign is outlined with a nice finished looking pinstripe. The best news is that now over the past few weeks, these new signs have been popping up, replacing the old ones all over town. Before too long, there won’t be a single old transfer sign left. 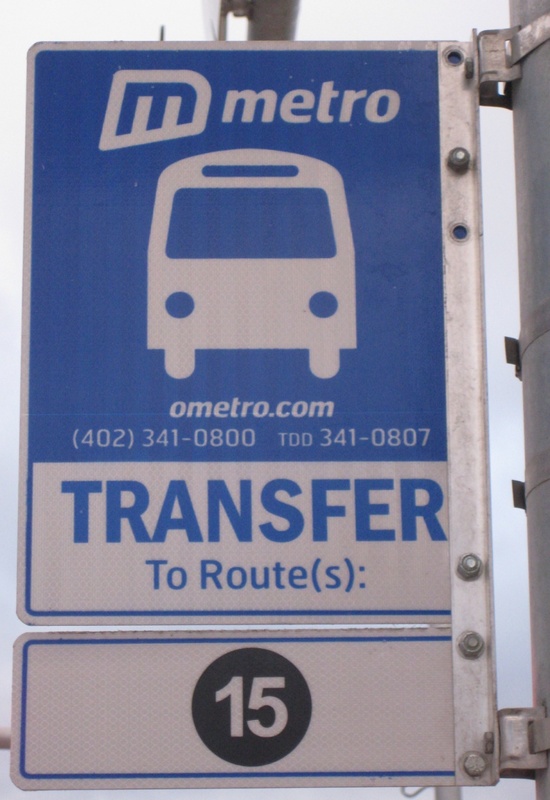 UPDATE: Metro informed us that the new signs were purchased thanks to Activate Omaha.